Parking in the carpark at Alstonefield in the early morning sunshine the anticipation was rising for our first weekend hiking trip. A mixture of excitement and also some trepidation at entering into the unknown. Never before had either of us put a pack on our back and walked carrying everything with us. We were to camp ¾ miles up the road at a farm that we had found by phoning the local pub so packs on backs we set off to walk to our 1st campsite where we planned to set up camp (we’d never even pitched our tent before) and then spend the day exploring the local area. ¾ mile isn’t very far so when we found ourselves struggling with our heavy packs we began to wonder what we had gotten ourselves into. 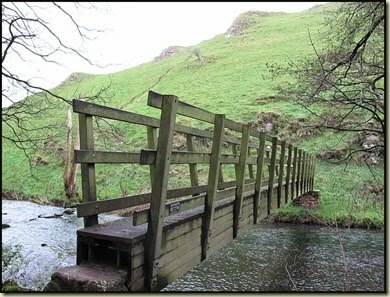 Our plan to walk along the Dove to a campsite near Hartington on the Saturday seemed a pipe dream (or perhaps an idea straight from hell). Thankfully a repack of our bags and some adjusting of straps and back heights solved the problem. On arrival we were shown the camping field and facilities, pitched our basic 2 man tent, fetched some water and then set off back up the road into the village. Tonight was a very important night, England were playing in the World Cup so we needed to abandon the outdoors for a few hours and find a tv! Alstonefield is an award winning village, with a village pub; The George, a village shop, a church and a number of places you can buy fresh free range eggs. 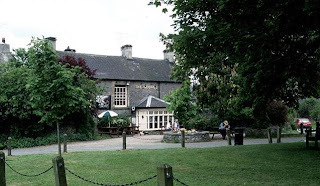 It’s small and quite perfect and at night, with villagers gathered in a meeting by the haystack made us joke about the film Hot Fuzz (“For the greater good”) or the Wicker Man. Entering The George with its dragon slaying mural, we quickly got the impression we’d not be watching the football here. A classy menu, with classy prices to match was displayed in the entrance and when we asked we were told “Oh no, we don’t have a television here!”. Our suspicions confirmed and our patriotic intent looking shaky we decided to walk over to Wetton, the next village to see if we could fare better there. By road it’s a winding journey but follow the footpaths and brave the field of young bulls and the trip is much shorter. The Royal Oak pub opens at 7.00 and had a fantastic welcoming atmosphere. To our delight there was one room set up with a big screen tv and also a smaller tv in the main bar area. The food was exceptional, I’ve never had such delicious peas as I had with my gammon and as I write this a couple of months later, they’re amazingly still worth a mention. Prices were good, service was with a smile and overall I would definitely recommend a visit if you are in the area. The next morning we awoke to the sun shining into the field and for the first time a view of the great outdoors. Packing up we set off down the lane, past the youth hostel and then down the steep hillside (home only to sheep born with 2 legs shorter than the others) and down to meet the River Dove. A peaceful walk along the far bank of the river followed until suddenly a terrible shrieking began. Looking around we could see a large bird of prey with a smaller one in its talons being chased by 2 others screeching and circling, presumably the young chicks parents. Soon it was clear that the young bird was lost and the victor settled down on a high crag of rock to feast. Nature at its most brutal and natural. After a few miles we crossed back over the river into an area where the sunlight dappled the ground through the trees and the overall effect was like a fairy glen. Through a gate and along the path to our next campsite. 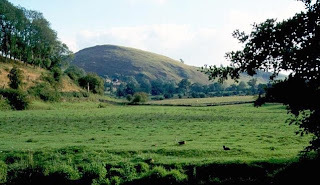 For a slightly longer walk, at 8 miles, you could begin at the car park at Dovedale, near Thorpe Cloud, and walk along past the popular Stepping Stones, Lovers Leap and the caves, a walk we did for my birthday earlier in the year. Barracks Farm Camping and Caravan site was, as the name suggest, much larger. It’s a commercial site set in 5 acres and this time of year was popular with families taking their kids away in the school holidays. It also filled up with a large group of kids doing their Duke of England but this didn’t cause any problems and was quite amusing watching them have to get themselves up, cook their food and wash up in the morning. One thing they did do well was bring some Fairy Liquid which we sneakily borrowed a bit of to help get our dishes clean! Late afternoon we walked into Hartington, past the farm where the cows were getting ready for milking and via a slight deviation up the nearest hill for some phone signal. The river curves away to the left so this part of the walk was along open grassy land. 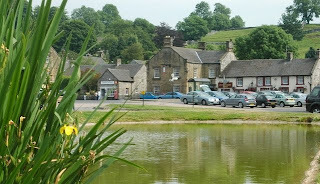 Hartington is an old market town which used to produce 25% of the world’s Stilton. It’s quite picturesque with its duck pond, church, a couple of pubs and some shops and we wandered round and had a drink in the pub before heading back for some dinner. Now it has to be said, that this time and on every trip since we have been amazed by how good our camping food tastes. I know some serious walkers really reduce their food down to ensure its the lightest, easier food possible. Whilst you’ll see from our later Snowdonia trip, where we took all our food for 5 days, that we think carefully about what we take, we do love our food and it’s very important to us. This time we cooked some 14p chicken curry noodles with some chicken and they were truly delicious. So that was our first trip into the unknown. And we were hooked. We’d learned some lessons about packing our bags, the amount of weight we’d taken and I needed a new sleeping bag for the next trip after struggling on a freakishly cold June night but we were definitely going to be going again very soon.